No matter what healthy lifestyle we choose to follow (or not), there is one thing we are all aiming to get better at: eating more vegetables. If we were to create a Venn diagram comparing all nutrition philosophies, programs, plans, trends, and lifestyles, there would be only one thing in common: eat a ton of veggies. By now, we can all agree that they should be the foundation of our daily fuel. Unfortunately for some, it’s much easier said than done. Here’s where I come in with my food prepping hacks. Since having my daughter, I have shifted from full-out meal prepping to food prepping. I’ve found that simply preparing ingredients in advance is what’s worked best for me and it’s been that way for well over a year now. Food prepping allows me to save time when making meals, but also allows me to be creative in the kitchen. With the convenience of ready to go vegetables, I quickly realized that I was eating more than I ever have before. Even if I did not have specific plans for the ingredients I chopped, minced, sliced, and roasted, I always used them up and sometimes in the most creative of ways. Over the past few months, I have noticed repeat offenders in my vegetable food prepping game. These repeat offenders have worked miracles for me so I want to share them with you. Always keep in mind that there are no rules when it comes to meal or food prepping. Do what you can in the time that you have. Any little bit of advanced preparation will save you a ton of time in the long run. I find I usually go through a solid food prep twice a week. Those few hours of hustling are tiresome, but are always so worth it; just like a killer workout! I have a one year-old so we are pretty experienced in the art of purees. I never realized how incredibly versatile and handy blended foods could be until my daughter started solids. I found myself adding tons of purees I had made for her into my own meals because well, it was just so easy. I learned that there are a zillion ways to effortlessly add a variety of different vegetables into dishes without comprising taste and improving texture at the same time. 1// Use in place of a traditional mashed potato. After pureeing the cauliflower (instructions below), I add grass fed butter, garlic, and salt and pepper and serve it on up. 2// Add the puree to oatmeal. I cut down the amount of oats I would normally use and replace it with some puree. Mix cinnamon, coconut or nut milk, and a tad bit of any all-natural sweetener to the puree. The cauliflower taste vanishes completely and makes for the dreamiest, creamiest bowl of oatmeal you’ve ever laid eyes on. I realize there may be some skeptics in the crowd so I want to share that I have had many parents of the pickiest eaters thank me for this idea. They are able to successfully get some veg into their kiddos (and/or spouses) without any suspicion whatsoever. • Break up your cauliflower into large florets and let them soften through with a good steam or boil. • Once your cauliflower is nice and soft, strain it (but save the water) and place it in a food processor or a blender. Add a tiny little bit of the steam water and blend. If the cauliflower isn’t fully blending, keep adding water in very small amounts until everything is creamy, dreamy, and smooth. • Scoop the puree out into a glass air-tight container and use it creatively. Do not season it with anything yet. We want to keep it inviting for all sweet and savory possibilities. • It is best to blend the cauliflower shortly after steaming it, but you can blend it the following day if you wish. Should you choose to blend your vegetable hours later or the next day, I highly recommend reheating the cauliflower first. Working with it cold may result in adding more liquid than necessary and your puree could end up way too watery. • The puree should keep for 4 days in the fridge. If you find you have too much and won’t be able to use it all up, freeze the puree in ice cube tray portions. Those would be awesome to add into smoothies or to thaw and use for anything, of course. 1 // Buddha Bowl: layer your roasted vegetables over a cooked grain and your favorite legume. Make an easy drizzle for this bowl by mixing 1 tbsp of tahini with 1 tsp of tamari sauce and enough water to thin it out to your desired consistency. 2// Warm Salad: Now that fall has arrived, another fabulous idea is using these roasted vegetables in salads. The warmth gives salads a whole new comforting dynamic. • Preheat the oven to 400 degrees Fahrenheit. • Cut 3 large beets in thin and even slices. • In a large bowl, toss them with 1 tbsp. avocado oil and a pinch of sea salt and black pepper. • Spread out the slices on baking sheets covered with parchment paper. Do not pile them on top of each other – this will result in uneven cooking where some will burn and others will take longer to bake. • Bake for approximately 15-18 minutes and flip them halfway through. They are done when they are on the verge of getting crispy. Note: The bake time will vary and is dependent on the width and size of your beet slices. Check on them occasionally and adjust your cook time accordingly. These are highly addictive! We love salads around here and use them to complete many of our meals. Half of our plates should ideally be comprised of vegetables. When I have salads in the fridge and ready to go, that half plate challenge is no task. Salads have a bad rep as they are the face of dieting, associating them with a negative mindset. To avoid your salad from being repetitive and boring, my advice is to switch up your salad ingredients each week. There is never room for boredom when variety is involved! Once you experiment with different leafy green and vegetable combinations, you’ll appreciate your creations. This will lead to an attitude shift. Instead of eating salads because “you should” you will eat them because you genuinely want to. Play around with fresh herbs and raw nuts and seeds as garnish to add unforgettable flavor and to add texture. I have been prepping salads for the longest time and I end up thanking myself for this on a weekly basis. It’s just such a life saver and pairs well with that lonesome wrap, the bowl of soup, the pasta dish, and/or the hearty burger on your plate. 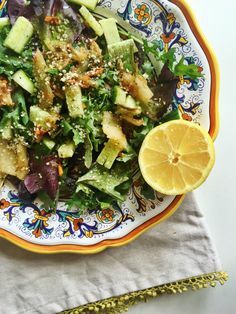 • Dressing (example: Honey Mustard Dressing: 1 part each of Dijon, honey, apple cider vinegar, and extra virgin olive oil. Salt and pepper to taste). • Fresh lemon juice to squirt on and toss as the last step. This helps keeps the salad fresh. Related Reads: 8 Steps to Get You Started With Meal Planning, The Cauliflower Smoothie, Cauliflower Flatbread Pizza, and 10 Nourishing Salad Bowls.